WilliamsSonoma.com. Even if you cook relatively often, review these tips from Chef Danielle Turner. Chef Turner teaches cooking at venues such L’Academie de Cuisine, Whole Foods, Sur La Table and Williams-Sonoma, as well as on her website, CookingClarified.com (check out all the great tips there). We adapted this tip from the original article on Care2.com. Here are five of the most common cooking mistakes she witnesses, and how to avoid them. You should never put yourself in the position of wondering, “What do I do next?” Read the recipe as many times as necessary to familiarize yourself with what you’ll actually be doing. This ensures that you have all the required ingredients and equipment; Re-read it right before you start to cook. Cooking is chemistry: Adding ingredients in the wrong order, omitting them or using the wrong ingredient (baking powder instead of baking soda, for example) can compromise your dish, which wastes your time and money. You wouldn’t put an unbaked cake or chicken into a cold oven: Preheating is essential for a successful outcome. It’s the same with stove top cooking. Unless the recipe specifies a cold pan, give the pan and any oil (or other fat) a little time to heat up before adding the food. Heat encourages the ingredients to release the moisture stored inside them. 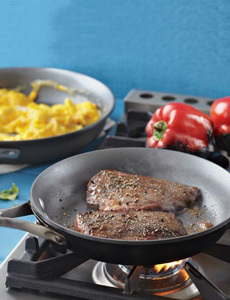 Adding food to a hot pan creates an instant seal around the food that locks in moisture and flavor. Added to a cool or warm pan, the food will lose moisture. A hot pan should give off a sizzle when you add food it. If you don’t hear the sizzle, pull the food out while you wait for the temperature to rise. Of course, you’ve got to be careful not to overheat the pan and the oil. If the oil starts to smoke, remove the pan from the heat immediately and let it cool down. A pan that’s too hot will break down the oil, which can give the food an unpleasant taste—not to mention burning them. Worse, the oil can catch fire. Place your palm over the pan. If the pan is hot enough, you’ll be able to feel the heat when your hand is two or three inches above the surface. If your pan has no oil (water and oil don’t mix), sprinkle a few drops of tap water onto the surface (run your fingers under the tap and shake them onto the pan). If the pan is hot, the water will sizzle and evaporate instantly. If it’s not hot enough, the drops will sit there or roll across the pan. Some people like to flip, re-flip and flip again…and again. This is a bad habit: Give it up! The hot pan or grill is perfectly capable of cooking the food with minimal physical intervention. You still need to watch food, but most foods don’t require constant hands-on attention. The heat from the pan or grill is transferred to the food through direct contact. The food has to reach a certain temperature in order to reach “doneness.” Every time you flip the food, it loses contact with the pan and has to start the heating process all over again. So by over-tending, you’re actually extending your cooking time and you run the risk of altering the food’s texture and color by moving it around too much. How’s your chicken breast going to brown if you keep interrupting contact with the pan? Some foods do require constant attention and your recipe will so indicate (“stir continuously for 5 minutes,” for example). Cooking without tasting is like painting a picture without looking at it. If you don’t taste the dish in progress, you may end up with unbalanced flavors or lack of seasoning. Good cooks season and taste, cook some more, then season and taste, regardless of what the recipe says. Recipes are not infallible. There are typos and editing mistakes, and then, there are personal preferences. What is too much garlic or jalapeño for one household is barely a hint to another. Recipes are good guidelines, but they’re not the last word. Every oven and stove cooks differently; cold ingredients cook more slowly than those at room temperature. A recipe may instruct you to cook a piece of fish for 15 minutes; but if you don’t look at it until the timer goes off, you may have woefully overcooked fish. Cooking is not always an exact science, unless you’re baking, which is an exact science (and requires an oven thermometer to ensure your oven is cooking at the right temperature). With stove top cooking, you have to find a balance between your recipe and reality. Oven strengths vary. 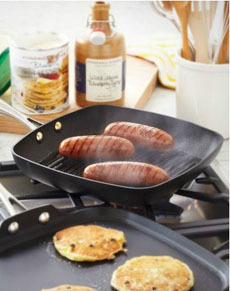 An electric cook top may not heat your sauté pan as quickly or evenly as the gas range used by the recipe writer/tester. Check your food periodically and if the food is starting to burn after 4 minutes in the pan, lower the heat and flip it, even if the recipe says cook for 5 minutes per side. Cooking is an art requiring practice, common sense and skill. The more you cook the better you get. And don’t hesitate to ask for help from others who cook. Or throw your question to the winds of the Internet.